The new UNO-DM-PLUS-US series is now available for immediate shipment in the US. Available in five power ratings, from 3.3 to 6.0kW, these solar inverters have a compact design that delivers high performance with excellent power density enabling maximum energy production. They are designed with digital intelligence and technical sophistication that optimizes the performance of residential PV installations. Code compliance is not a problem with this family. The UNO-DM-PLUS-US series is Rule 21 phase 2/UL1741-SA and is SunSpec Certified. The UNO-DM-PLUS-US series is compatible with ABB’s string-level Rapid Shutdown. 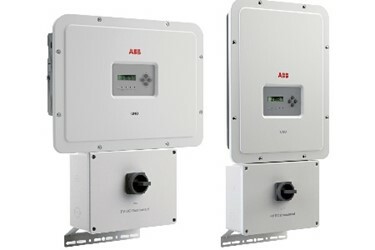 The ABB RSD 2.0 unit is available in single and duel channel connections and in-stalls to the panel in a snap, literally. This flexible inverter design comes with embedded connectivity and efficient communication SunSpec Protocol, which enables the UNO-DM-PLUS-US to be easily integrated within any current or future device for smart building automation, smart grid integration and with third party monitoring and control systems. The UNO-DM-PLUS-US also comes with remote Over the Air (OTA) firmware upgrade for inverter and components. Once the inverter is installed, operators can turn to a smartphone to commission the unit via a simple, built-in web user interface. This enables them to gain access to features such as advanced inverter con-figuration settings and Aurora Manager, which facilitates OTA firmware updates (remote software up-dates). Further efficiencies gained, with installation times greatly reduced due to an easy commissioning wiz-ard, which simplifies the configuration process resulting in lower installation time and reduced costs. For more information about the products, services and training visit www.abb.com/solarinvert-ers.